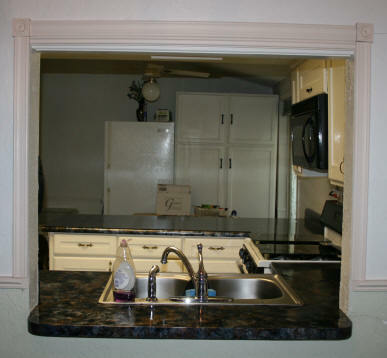 When looking at the counters above and to the right you might think they look okay. Outdated, yes. Until you look closely at them. Then you see the problems. Dents on edge of counter to the right of the sink. These were done by the previous owner, probably having to do with the dishwasher that was in this spot when we moved in. There were a few cut marks on the counter when we moved in. Nothing compared to what I did to it. Since I hated the counter, I used it as a work bench for my various projects. Particularly during the winter, when the garage was too cold. See the photo to the right with all of the cuts I made on it. I always knew I was going to get rid of it......until I got an estimate. 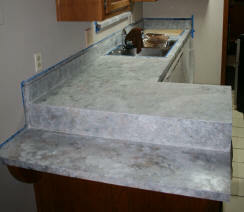 Boy, do new counter tops cost a lot! 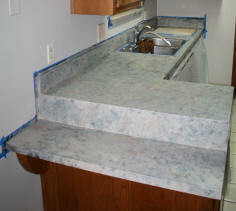 There were also the counter seams we dealt with. 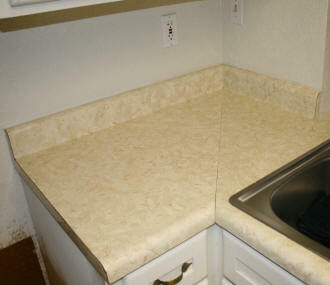 The seam to the left of the sink would swell up if water got on it. For the last three years I have been careful to not let any water collect there. 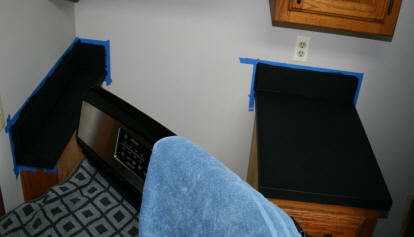 To the left of the stove, the seam did not swell but was just..... visible. 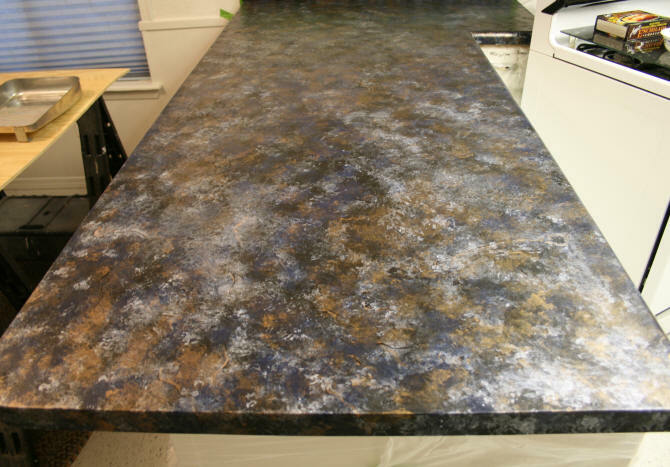 Three years ago, when I was looking for counters and options to fix what I had, I came across the option of painting the old counters a faux granite finish. I was a little skeptical at first. 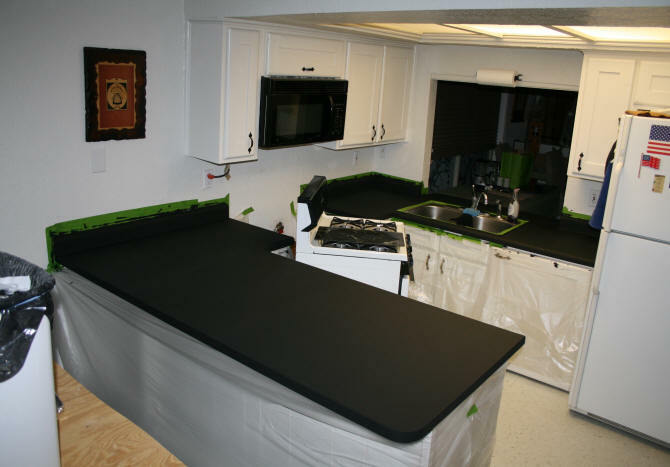 I thought, no way could a paint job be tough enough to stand-up to the abuse a kitchen counter receives...even without someone using it as a work bench. The brand I came across Nov 2012, was Giani Granite. The reviews were good based on some other dyi-ers who have posted videos and photos on the internet. It looks like a few did reviews after receiving the kit from Giani....hmm. However, my review below was not paid for. I paid for the kit. Everything they list in the kit is there. 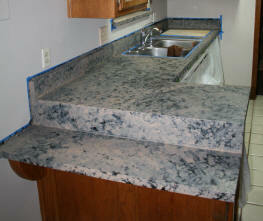 However, I wanted a little blue on my counter. So I ordered an additional can of the mineral color Sapphire Blue. When I purchased the kit Nov 2012 it was $69.95 on their website. The extra can of the blue was $7.77. The price for the kit has now jumped to $79 as of 2015. Three years later, I am now ready to take on this project. 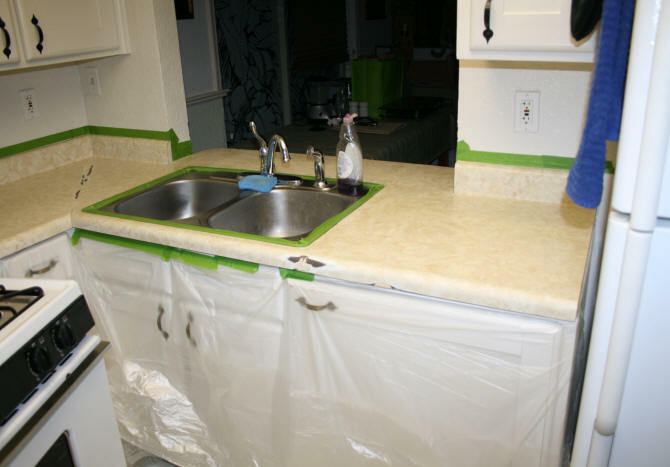 The first thing that needs to be done with your counter is the preparation. As with most projects, the prep work will usually take the longest. 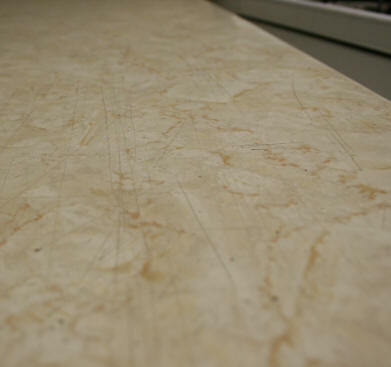 According to the instructions all you need to do is scrub down your counter with SOS pads, remove any silicone caulk, and fill in any gouges with wood filler and sand. Then mask everything off you don't want paint on. In my case, I had some serious work to do. 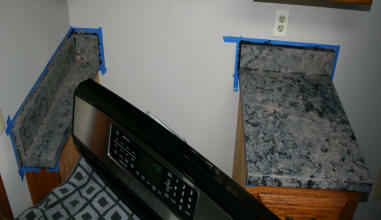 So instead of the SOS pads, I used sandpaper and wood filler to prepare my counter tops. I had a lot of cut marks to try and sand down. An entire day was spent sanding down the counters. Then I masked everything off. 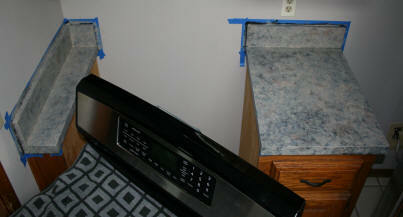 Using plastic to cover my cupboards below the counter. 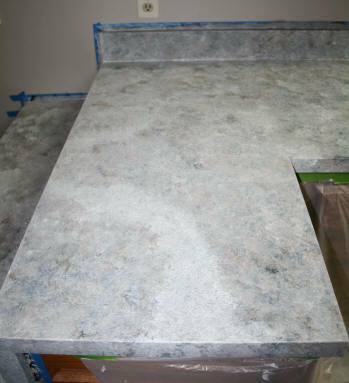 After the counters have been properly prepared and cleaned you are ready for the first step of the kit, the primer. 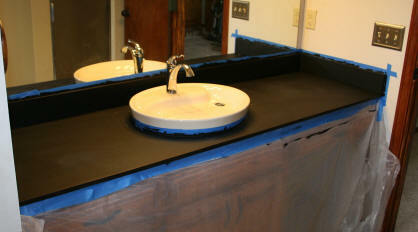 The primer rolls on easily and when it dries, it looks and feels like primer or like black chalkboard paint. Before the next step, you need to let the primer set for 8 hours. Since I did this step at the end of the day, no problem, I will do the next step tomorrow. The next day I started applying the colors or "minerals", as the company calls them. You layer them on by dabbing your sponge on the counter. If you follow the instructions they give you, it is really hard to screw this up. If you don't like something, you can just cover it up with some primer or another color and re-dab. You dab away until you like the look. Your counter. Your artwork. The photos above show the first two colors. A note about the second color, Black Onyx. Yes, you are dabbing black on a black surface. 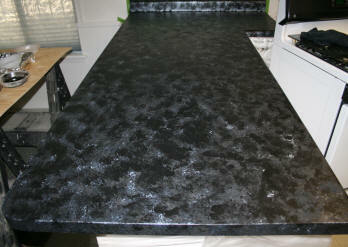 However, the Black Onyx is a little darker than the primer, so it helps to add some depth to the surface. The photo below shows the results after I added the Sapphire Blue (which was NOT part of the Bombay Black kit), the third kit color, Bronze, and then I went back and added in some more of the Pearl Mica. Like I said, it is a personal preference. You add colors until you are happy with it. Counter colors now complete. Ready for clear coat. A note about the blue. In person, you can see it on the counter. With the flash on my camera, it accentuated only the blue. Without the flash, the photo is closer to how the counter actually looks. So the two photos above were taken without a flash. The next step, is the application of two coats of the Automotive Grade Polyurethane Topcoat which can be applied after 4 hours. I will do it the next day. 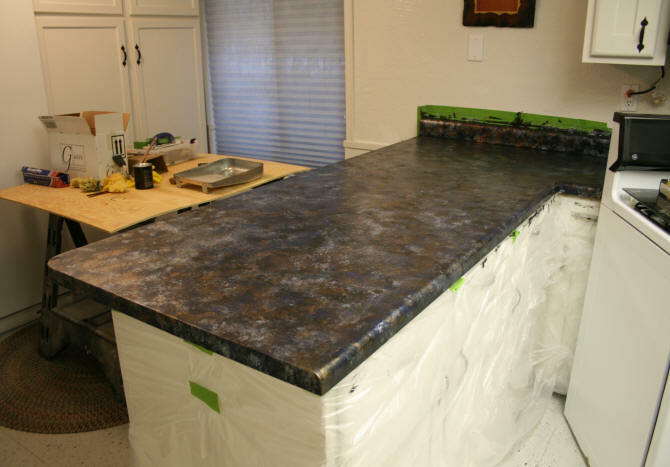 Before applying the topcoat, you need to feel the surface for any rough spots. If you use a soft microfiber cloth to gently wipe it, you feel it snagging on the rough spots. Giani says to sand it with 600 grit sandpaper. I did it with 800 grit because the Home Depot I stopped by the day before did not have 600 at the time. I found the sand paper also works well to fine tune your paint job along with your finger nails. A spot of paint? No problem. Just scratch it lightly so it does not look like a spot. Sand an area gently if there is a streak you want to get rid of. Do not press too hard or you will remove the paint!!!!! You apply the first topcoat following their instructions. Wait 4 hours to do the second. Then you do the hardest part. Do not use your new counters for 14 days until it cures. Since most of my food preparation involves popping something in the microwave, I can deal with this. I can only imagine the hardship this causes in a household full of children or a gourmet chef. 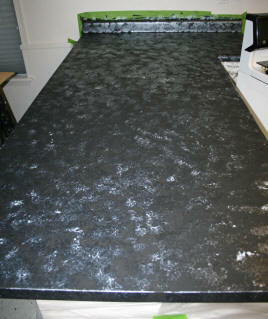 See photos below immediately after the second topcoat was put on and the masking removed. Heck yeh!!!! I love it. I can now live with this kitchen until I do a complete demo, if I ever have the money. Did it cover all of the flaws? Most of them. Remember my counters were in pretty rough shape. I did not expect to have perfect looking counters with just paint. The shine in fact, actually highlighted some issues, I did not even know were there. Like a ring that appears to have been caused by a hot pan in the past. Did not even see it before I started. If you just walk into the kitchen, all you see is awesome. If you start bending over and looking at the finish from different angles you can see some waves in the surface and some cuts I did not sand down enough. The seams are still there, just not seen right way. You turn your head a certain way, they are there. What about those huge gouges to the right of the sink? Uh.....what gouges? See below. Gouges are now all covered up. The El Paso home shown above was sold in April 2018. We have since purchased a new home in Oklahoma. 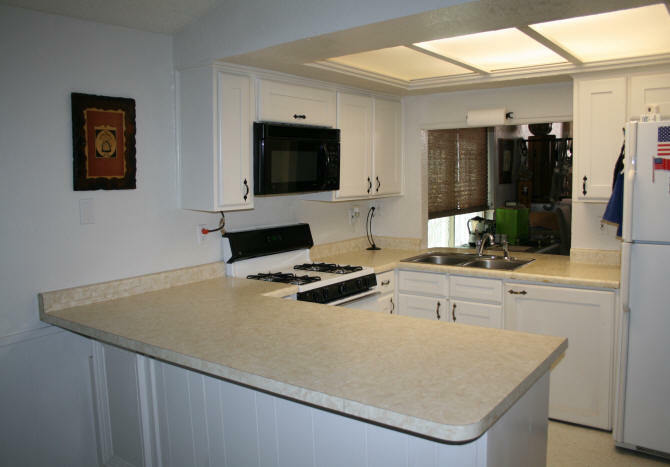 We now have the small home in Lawton, OK to sell after we make some improvements. 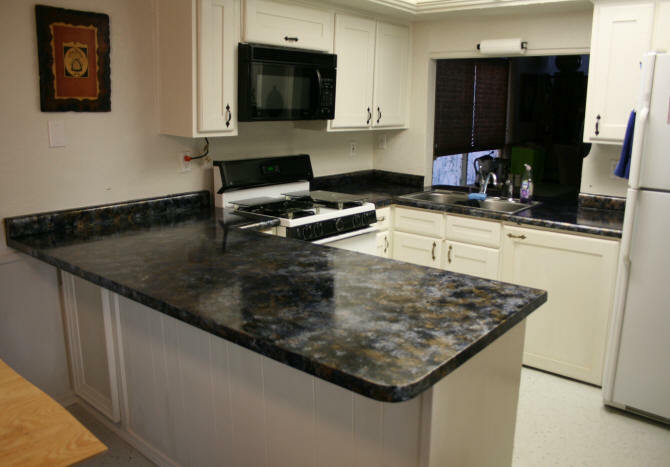 Unlike the El Paso house, the counters in the home in Lawton, are in pretty good shape. A few small nicks. No stains, burn marks, or knife marks. On the other hand, the counters are very outdated. 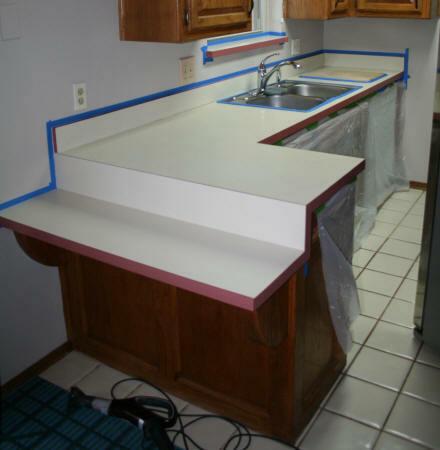 The kitchen counter would have been fine if it didn't have pink laminate on all of the edges. What 1980's counter trend that was, is unclear. 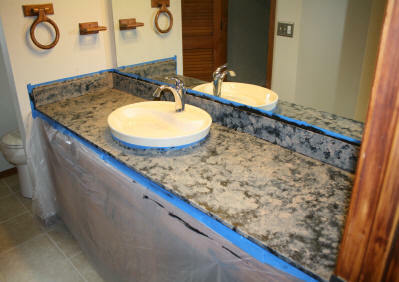 I decided to use the Giani Granite Countertop paint on the kitchen and master bath counters. This will give the house a little update even if it is only paint. We just do not have the money for a large remodel in this home. 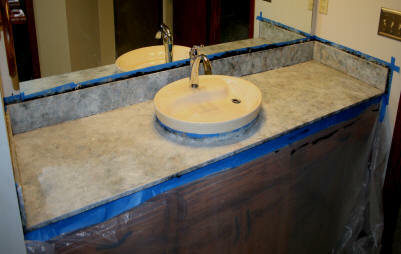 In the master bath, the counter is cultured marble. 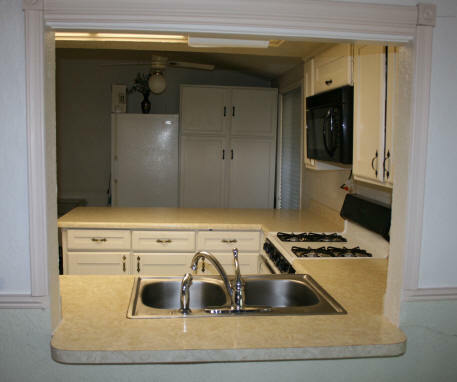 The previous owners had cut out the built-in shell shaped sink and glued in another sink on top of the hole. original sink cut out and a sink added to cover the hole. 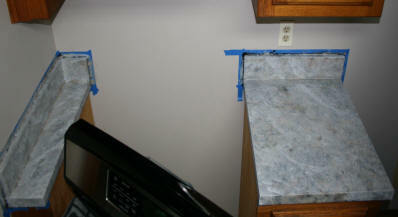 The only evidence of this is between the sink and backsplash where there is a crack and part of the old faucet holes. The paint will cover this up. 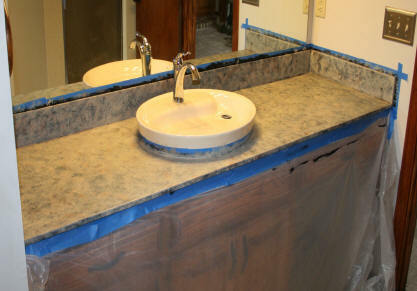 If the sink had still been here, like it is in the hall and downstairs bathroom, I would not be able to paint it. 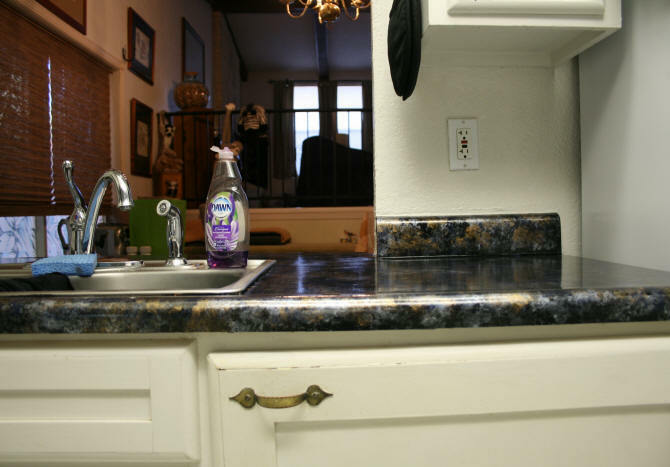 The countertop paint CANNOT be used IN a sink. 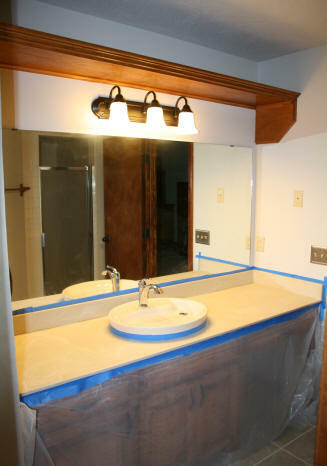 The counter tops in the master bath and kitchen were masked off and then sanded. 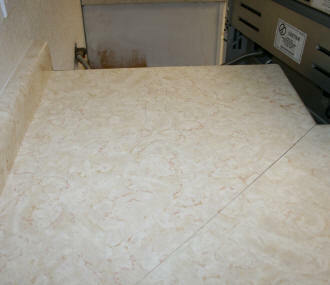 Sanded counter were then followed up with a good cleaning. 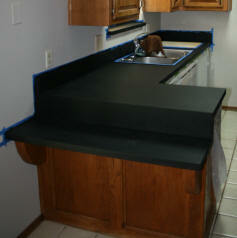 The first paint step is to paint the counters with the primer. 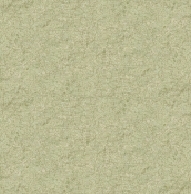 Inca Gold - which is a light beige color. Not sure where they got the "gold" from. I would have preferred to see a little metallic gold in the color. At this point the counters are looking a little too gray for me. 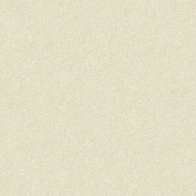 I am going for a beige tone. Not gray. I think the primer color should have been a dark brown, not black. I did a little white veining design to break-up the pattern. Yep, way too gray. I will go back and add more brown and black on top of this.